Allergy to peanuts is one of the most commonest allergies in children over 3 years old. Because of the high incidence of nut and peanut allergy, in the UK it is advised that you do not give any child nuts including peanuts under the age of 5. Peanuts are increasingly added to our diet for their nutritional value and low cost, and are present in a large majority of products we consume daily. On the other hand, peanuts improve the taste, quantity and texture of many foods. The number of children affected by peanut allergy is steadily increasing. The number of children allergic to peanuts has multiplied twofold over the past ten years. The peanut allergy does not tend to disappear and persists into adulthood. Approximately 20% of children eventually grow out of their allergy. The peanut allergy presents with rhinitis, urticaria, atopic eczema, asthma, vomiting, abdominal pain, symptoms can be in isolation or in combination with others listed. It can cause severe skin reactions, digestive but also anaphylactic shock. A child allergic to peanuts should carry a card or wear `MediAlert' bracelet stating they are allergic to peanuts. 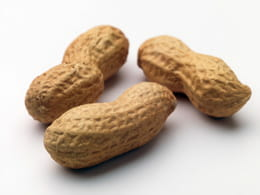 Children that have had severe allergic episodes to peanuts must always have corticosteroid drugs and a pre-filled syringe of epinephrine with them at all times. Teachers in schools and other carers of children may require training for administering epinephrine and spare syringes prescribed for children to have at school, nursery or second homes. A doctor who specialises in allergy testing will make the diagnosis. Skin prick testing maybe performed and blood samples taken to check IgE levels to measure the antibodies responsible for peanut allergy. Confectionary and preparations with the words "vegetable oil" or "fat" without further clarification, such as chips for example. Pastries, chocolates, pralines, ice cream, nougat, marzipan tart, chocolate bars with nuts. Dried fruit and potatoes because of possible cross allergies to nuts: your specialist doctor will advice you on the safety of eating these things. Nutty based icings on cakes. Peanuts and peanut oil are sometimes called `monkey nuts', Groundnuts or (groundnut oil) Arachis oil, and mixed nuts. It is therefore important to avoid product that has oil in it unless it is specified whether peanut oil, olive or sunflower oil. Many cosmetics, some shampoo and some drugs contain peanuts. Food for fish and birds may also contain it. At a restaurant, do not hesitate to ask the chef about the oil they use, they will know what ingredients have been used in dishes and sauces, especially in ethnic restaurants, - as the most severe reactions occur in these circumstances. Ask if your baker uses lupin flour to improve the flexibility of his bread and buns. Treatment of peanut allergy is to avoid eating peanuts in all its forms. For more information and forums on peanut allergy see links below. Latest update on July 9, 2010 at 06:39 AM by Janey39. This document, titled "Peanut allergy," is available under the Creative Commons license. Any copy, reuse, or modification of the content should be sufficiently credited to CCM Health (health.ccm.net). Allergie à l'arachide Alergia al cacahuete o maní Was tun bei einer Allergie gegen Erdnüsse?